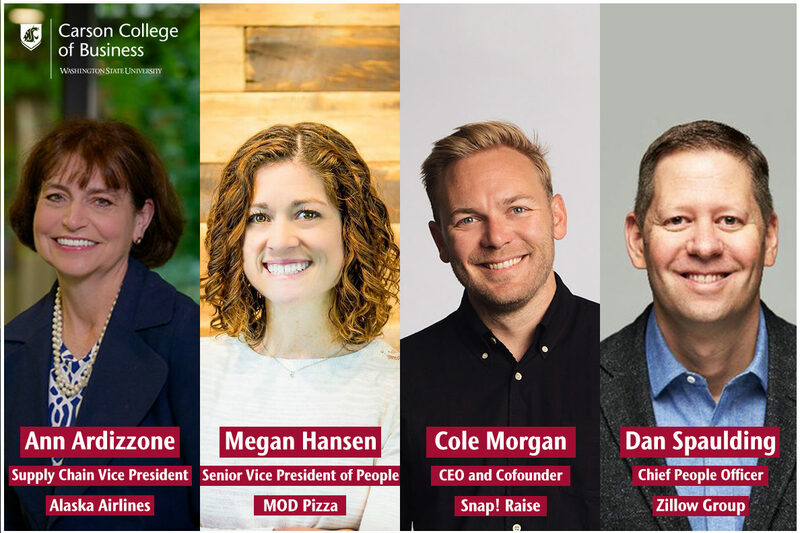 SEATTLE, Wash. – Four panelists will speak on the topic “Business and the Millennial Generation: Consumers, Leaders, Game Changes” at the annual Power Breakfast networking event hosted by Washington State University Carson College of Business. The event will be held 7:30-9 a.m. Thursday, Sept. 27, Sheraton Seattle Hotel. The Power Breakfast is designed to inform, inspire and engage Seattle-area leaders on contemporary business issues. Tickets are $40. Registration is available on the Power Breakfast website until 5 p.m. Thursday, Sept. 13. Ardizzone is responsible for supply chain procurement, sourcing and contract management. She is also responsible for risk management, overseeing insurance requirements for airline hull, spare and comprehensive liability. Hansen is a human resource leader who guides the MOD people team, along with enriching the work experience for the 5,000+ MOD Squad members across the United States. With a commitment to creating an authentic and meaningful employment experience at all levels of the organization, Hansen ensures a people perspective is top of mind with all strategic and tactical business decisions. Spaulding oversees the Zillow’s human resources, recruiting and learning and development teams. He focuses on creating solutions to attract, engage, develop and retain Zillow Group’s employees across nine offices and multiple consumer and business brands. Morgan’s mission with Snap! Raise, a group fundraising solution, is to leverage cutting-edge technology and expert personal support to give back the time, energy and resources that youth coaches and educators need to achieve more. For Snap! Mobile, he leads the strategic vision for Snap! Raise, as well as Snap! Advance, a platform designed to streamline advancement and alumni engagement for colleges and universities. Most recently, he oversaw the launch of Snap! Shop, an online team store built to make ordering group and fan gear easier. Alaska Airlines is a presenting sponsor.